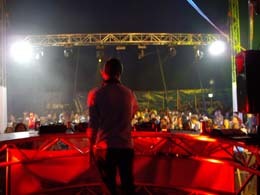 CLS designed, supplied and operated lighting and rigging for Stage 3, 4 and 5 at Dutch promoter IDQK’s rave party. 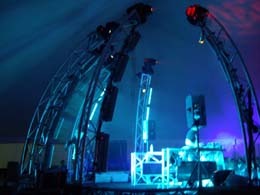 We took the opportunity to deliver a few new items from our rental stock like five DJ tables built from Curved Tri Truss sections in 2M,3M and 4M diameter (great with Tri-Colour LED toners). Our GrandMA console produced stunning matrixed pixel effects from 24 x Honeycomb LED Washlights on Curved Upright Tri Truss capped off with a Mac700 perched on top of each. 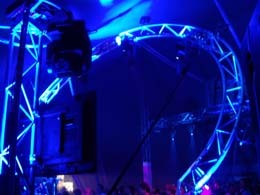 The giant white big top tent housing Stage 3 was also an ideal location to try out our 6M Tee-Pee Tri Truss Towers. 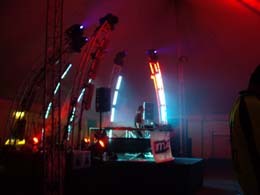 (9M Tee Pee Towers can be used outdoors to hang a PA and are easy to assemble with out machinery) The Tee Pee’s on this occasion had a Mac2000 on top, a 24in mirrorball inside the apex and a 42inch Plasma on each face. Once again Tri Colour LED cans were used to highlight each leg.